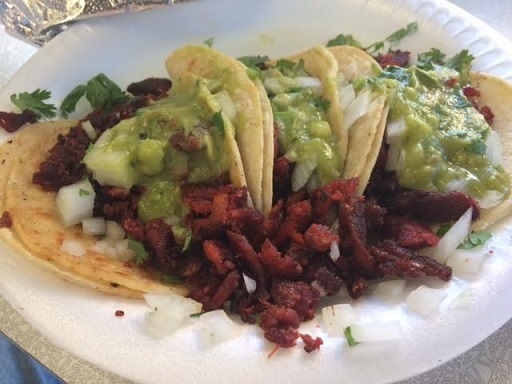 Holt through Ontario, Montclair and Pomona may have more taquerias than it does bus stops, muffler shops, 98-cent stores and streetwalkers — a bold claim, I know, but probably supported by the evidence. A dedicated eater could spend months sampling all the taco stands and ranking them for us. I don’t have the patience or the chops, but perhaps some foundation or other would sponsor a grant to an expert for such an undertaking. The results would certainly benefit mankind. 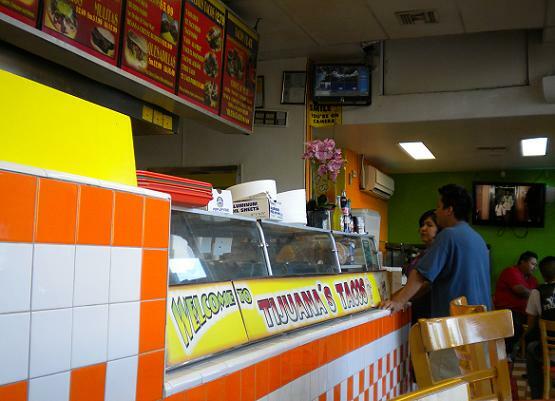 In the meantime, I can direct you to Tijuana’s Tacos. It opened in 2006 and I’ve been eating there most of that time. It was a surprise to find I’d never written it up here on my blog. The storefront is broad but so shallow that when you step inside, you’re practically in the kitchen, and you’re almost guaranteed to be in at least one patron’s way. (Virtually the entirety of the interior can be seen in the photo below.) For seating, there are two dinky tables inside, a counter with five stools and two larger tables outside. 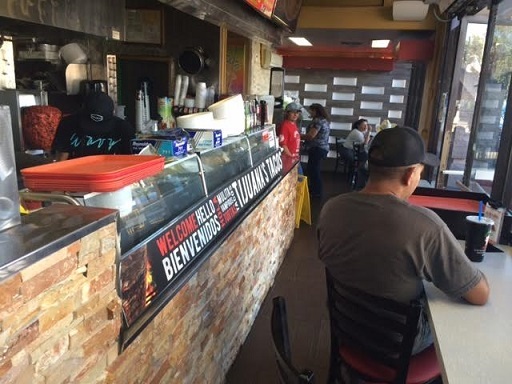 The menu has tacos, burritos, tortas and quesadillas, as well as the more unusual huaraches, vampiros and mulitas, with housemade guacamole a specialty. The women who work the register are bilingual, a helpful touch. 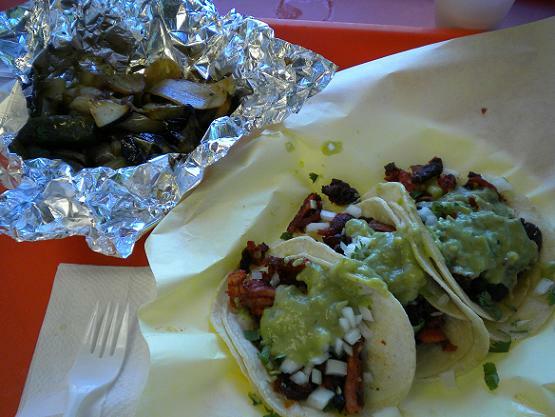 On my last visit I had al pastor tacos ($1.69 each), the marinated pork carved off a spit in Lebanese style, grilled until charred and crispy, served on doubled tortillas with onions, cilantro and guacamole, a piece of tinfoil on the side laden with grilled onions, peppers and nopales (cactus) for snacking or garnishing. They also hand you a small foam cup for beans or salsa from the bar. You can see the menu here. 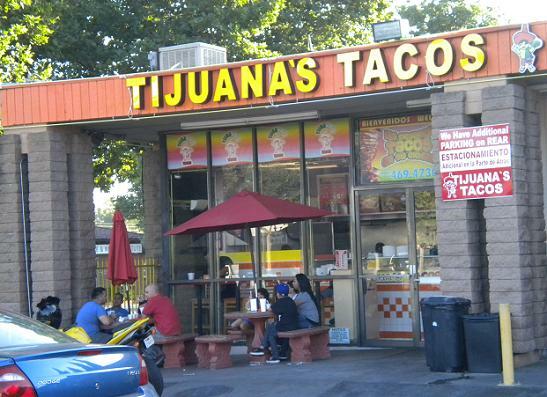 Tijuana’s Tacos also has locations in Ontario (1702 S. Euclid), Fontana (9260 Sierra), Riverside and Moreno Valley. Those cities will have to pursue their own taqueria grant. Update July 2016: Hey, they’ve remodeled! It’s still tiny, but it’s a little swanker. This entry was posted in Restaurants: Pomona and tagged Mexican, Pomona, restaurants, taqueias by David Allen. Bookmark the permalink. I’ve been to Tijuana and Tecate only about 1x or 2x in the last few years, but TJ’s Taco’s recreates something that other taco places don’t and has items that many others don’t and that is why this place is so great…if you can get over the grittiness of it. BTW, I’m here in Hong Kong and i’ve gone past 2 or 3 taco places. I pass by these places evelytime I come to HK, but I can’t ever bear to spend 10-12 bucks for 2 tacos in a Cantina. I am now in china, the people’s republic (not to be confused with the other china, republic of), and IFC has two burritos. A Mexican chicken flavor and a Beijing chicken one.